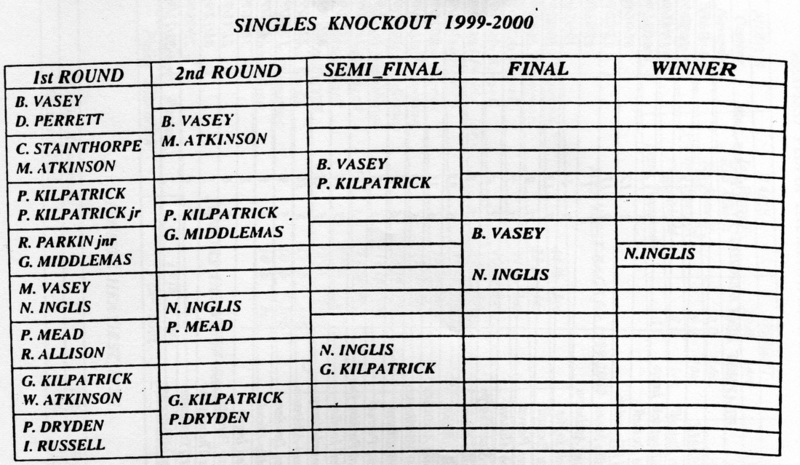 Singles Knockout runner up - Bernard Vasey. Doubles Knockout winners - George Middlemas & Colin Stainthorpe. Doubles Knockout runners up - Neil Inglis & Philip Kilpatrick (Jnr). Heaviest Fish in a competition - Ian Russell - 10 lb 14 oz. Christmas match winner - Ian Russell - 11 lb 02 oz - 3 fish. Christmas match Heaviest Fish - Denis Thompson - 5 lb 01 oz. 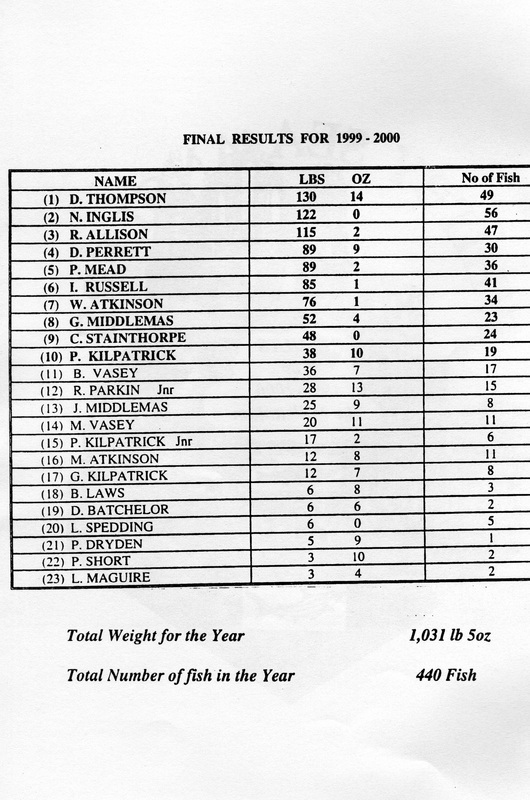 Greatest number of fish - Neil Inglis - 56 fish. 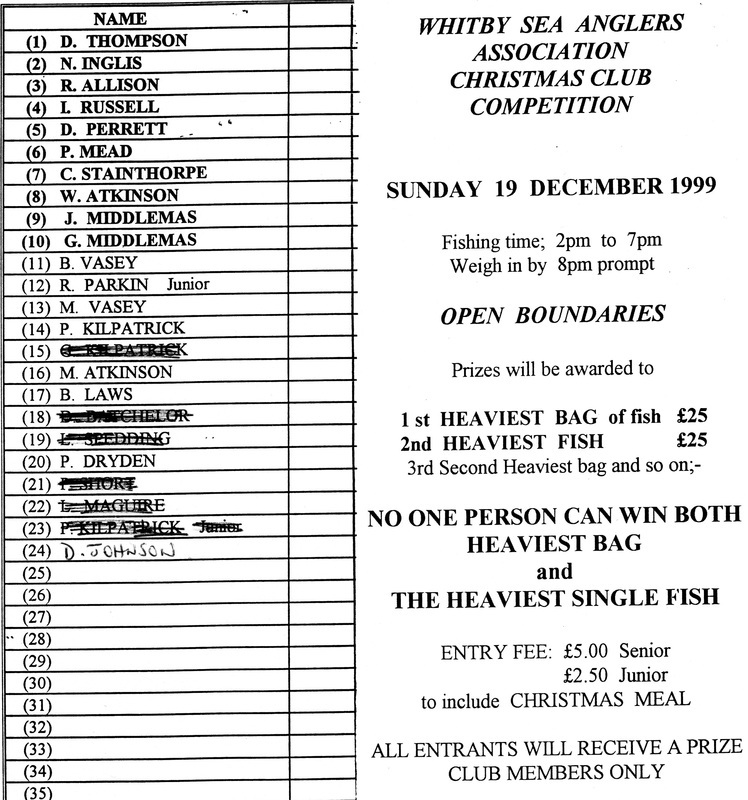 Heaviest Bag of Fish - Denis Thompson - 44 lb 13 oz - 13 fish - Winner of WSAA Annual Open Match, 14th November 1999. 1st - Richard Parkin - 28 lb 13 oz - 15 fish. 2nd - Philip Kilpatrick - 17 lb 02 oz - 6 fish. 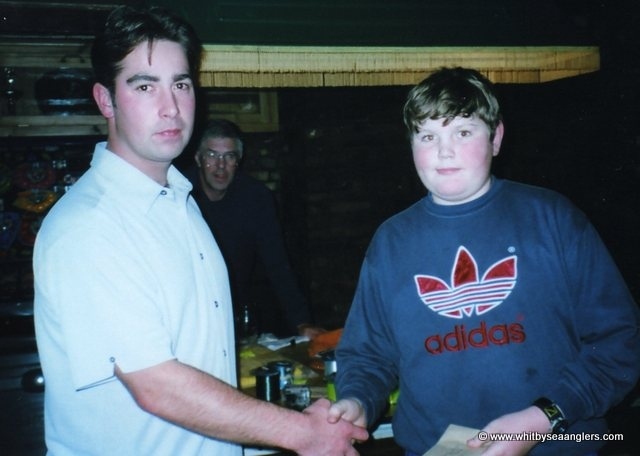 Richard Parkin - 14 lb 06 oz - 5 fish - 17th November 1999. Philip Kilpatrick - 9 lb 10 oz - 1 fish - 19th January 2000. Philip Kilpatrick - 9 lb 10 oz - 19th January 2000. Richard Parkin - 5 lb 13 oz - 17th November 1999. Total weight for the season - 1,031 lb 05 oz. Total Number of fish - 440. Notes:- PDH 21-12-2012 taken from ledger. 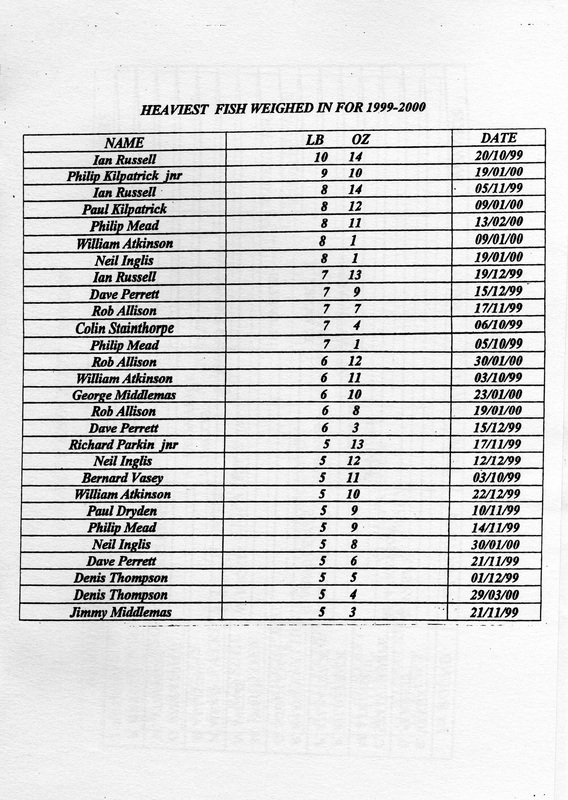 3rd October 1999 - William Atkinson Heaviest Fish - 6 lb 11 oz. 3rd October 1999 - Denis Thompson Heaviest Bag of Fish - 12 lb 05 oz - 5 fish. 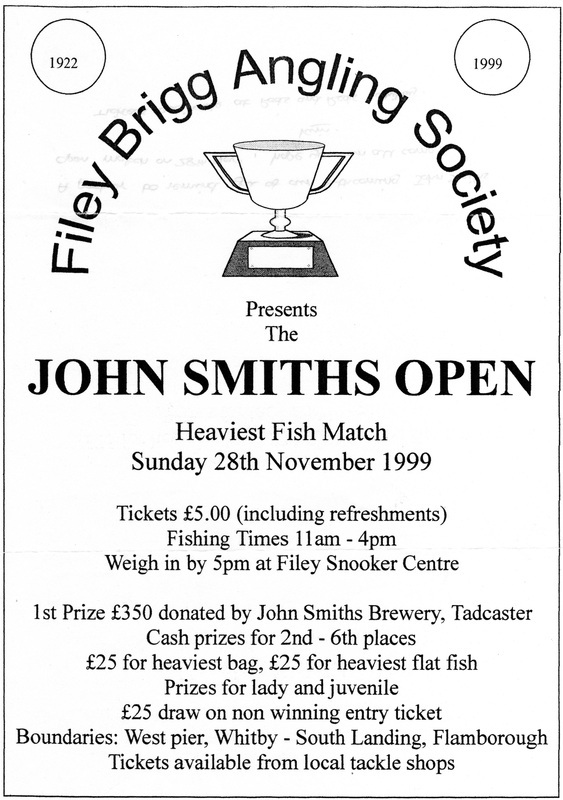 6th October 1999 - Colin Stainthorpe Heaviest Fish - 7 lb 04 oz. 20th October 1999 - Ian Russell Heaviest Fish - 10 lb 14 oz. 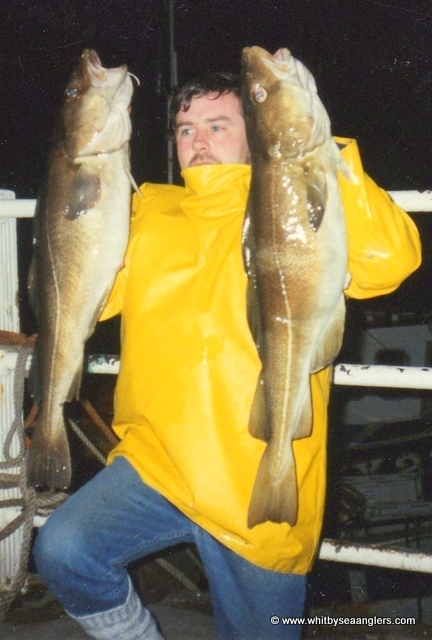 14th November 1999 - Denis Thompson Heaviest Bag of Fish - 44 lb 13 oz - 13 fish. WSAA Open Winner. 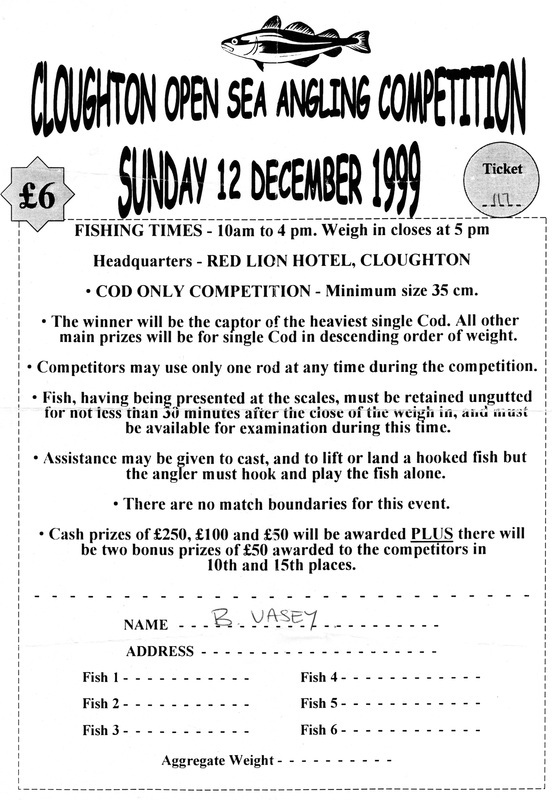 5th December 1999 - Ian Russell Heaviest Fish - 8 lb 14 oz, part of a 17 lb 03 oz bag of 5 fish. 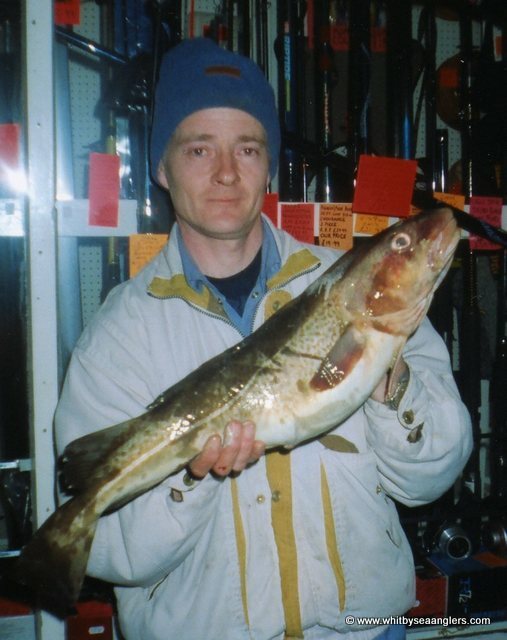 9th January 2000 - Paul Kilpatrick Heaviest fish - 8 lb 12 oz. 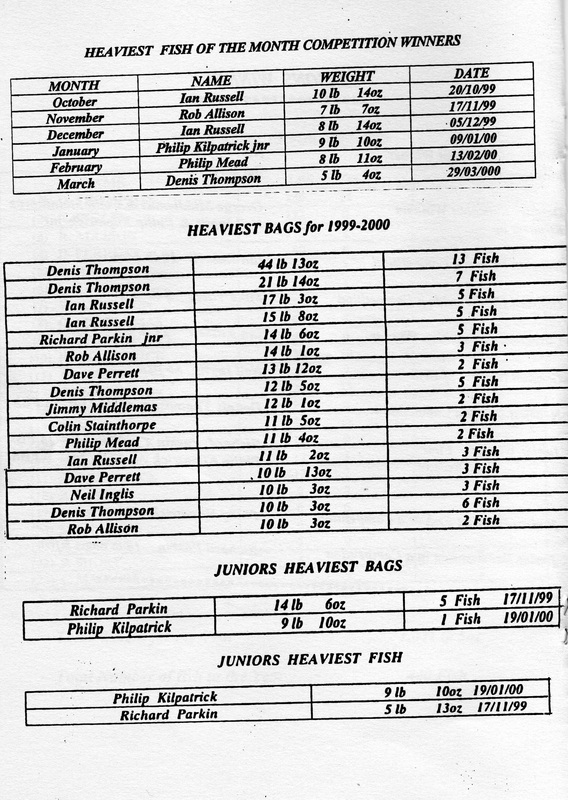 19th January 2000 - Phillip Kilpatrick (Jnr) Heaviest Fish - 9 lb 10 oz. Whitby Sea Anglers Association assembled at the Bandstand to start the 1999 - 2000 winter shore angling competitions. The sea was calm with very little movement as members fished a high water to ebb match, there were a total of 10 fished weighed in by 4 anglers with the heaviest fish of only 2 lb 04 oz caught by Phil Mead, some anglers reported ‘no bites’ but ‘plenty of activity from crabs’ in removing good baits of mussel and peeler crab off the hooks, leaving only elastic cotton. 1st - Neil Inglis - 6 lb 07 oz - 5 fish. 2nd - Phil Mead - 3 lb 07 oz - 2 fish. 3rd - Ian Russell - 2 lb 04 oz - 2 fish. 4th - Rob Parkin (Jnr) - 1 lb 02 oz - 1 fish. Sundays match for Whitby Sea Anglers Association gave an excellent result as a growing north westerly sea swell put some colour into the water as anglers fished a low water to flooding tide with light showers. Some marks were spoiled with loose weed but there were still a few better size codling landed with a 6 lb 11 oz fish from William Atkinson. 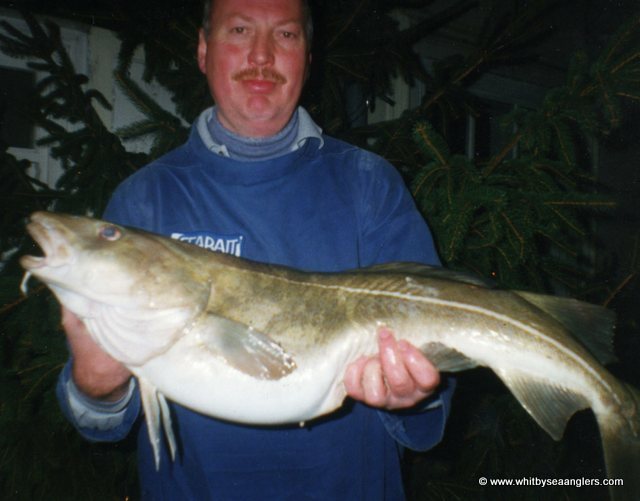 A 5 lb 11 oz codling from Bernard Vasey and Denis Thompson with a 5 lb 01 oz codling. 1st - Denis Thompson - 12 lb 05 oz - 5 fish, one of 5 lb 01 oz. 2nd - William Atkinson - 9 lb 12 oz - 3 fish, one of 6 lb 11 oz. 3rd - Les Spedding - 6 lb 00 oz - 5 fish. 4th - Bernard Vasey - 5 lb 11 oz - 1 fish, one of 5 lb 11 oz. 5th - Les Maguire - 1 lb 10 oz - 1 fish. 6th - Neil Inglis - 1 lb 04 oz - 1 fish. 7th - Phil Mead - 1 lb 02 oz - 1 fish. 8th - Mathew Atkinson - 0 lb 14 oz - 1 fish. The mid week match for Whitby Sea Anglers Association resulted in a win for Colin Stainthorpe, as he brought to the scales 2 fish for 11 lb 05 oz, one of which weighed in at 7 lb 04 oz. This is now the one to beat in the heaviest fish of the month sweep. There was still a falling north westerly sea swell as anglers fished a half ebbing tide to a low water flood. Ten anglers managed to find 16 fish as expectations were that there would be more from this type of swell. 1st - Colin Stainthorpe - 11 lb 05 oz - 2 fish. 2nd - Rob Allison - 5 lb 11 oz - 3 fish, one of 3 lb 13 oz. 3rd - Neil Inglis - 5 lb 04 oz - 4 fish. 4th - Mike Vasey - 3 lb 02 oz - 1 fish. 6th - Mathew Atkinson - 1 lb 04 oz - 1 fish. 7th = Ian Russell - 1 lb 02 oz - 1 fish. 7th = George Middlemas - 1 lb 02 oz - 1 fish. 9th = Denis Thompson - 1 lb 01 oz - 1 fish. 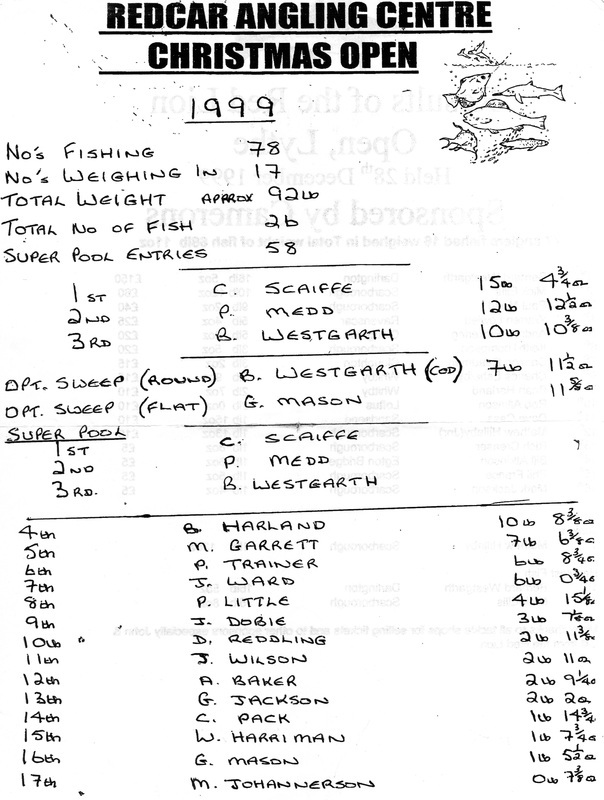 9th = Bernard Vasey - 1 lb 01 oz - 1 fish. The 4 hr match was a very poor show of fish for Whitby Sea Anglers Association members, with 2 codlings, 4 rocklings and 1 eel , which were brought to the scales. A high water ebb match and a flat calm sea with a south westerly wind took anglers to the cliff marks for the start of the match. 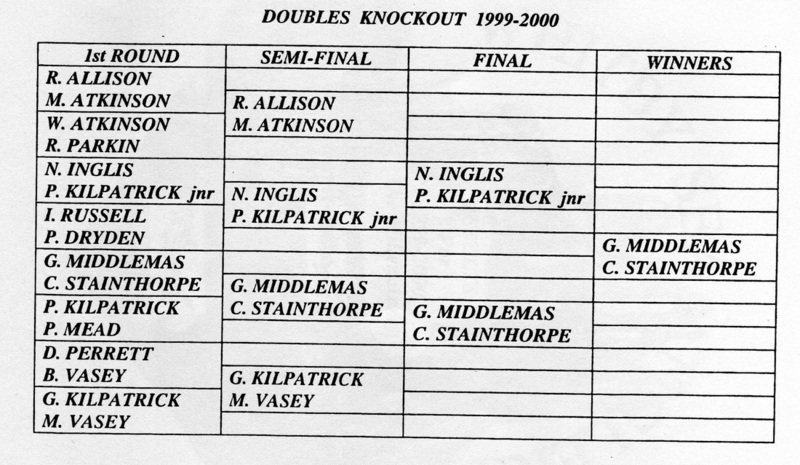 Again Colin Stainthorpe won the event. 1st - Colin Stainthorpe - 1 lb 14 oz - 1 fish. 2nd - Denis Thompson - 1 lb 08 oz - 1 fish. 3rd = Rob Allison - 0 lb 13 oz - 1 rockling. 3rd = Rob Parkin (Jnr) - 0 lb 13 oz - 1 eel. 5th - William Atkinson - 0 lb 10 oz - 1 rockling. 6th - Mathew Atkinson - 0 lb 09 oz - 1 rockling. 7th - Glen Kilpatrick - 0 lb 08 oz - 1 rockling. With the wind still in the south west the sea swell remained calm for Whitby Sea Anglers Association 3 hr evening competition. Once again the catches were low as 5 anglers weighed in 11 fish with the heaviest fish, a codling of 2 lb 10 oz falling to Neil Inglis. 1st - Neil Inglis - 5 lb 14 oz - 3 fish. 2nd - Phil Mead - 4 lb 14 oz - 4 fish. 3rd - Paul Short - 3 lb 10 oz - 2 fish. 4th - Mathew Atkinson - 2 lb 05 oz - 1 fish. 5th - Glen Kilpatrick - 1 lb 05 oz - 1 fish. The 4 hr match for Whitby Sea Anglers Association was a half tide competition with the wind changing round to the south easterly, there was a slight sea swell which put a little colour into the water, but the wind spoiled casting for some of the marks. There were a few codling weighed in, heaviest fell to Ian Russell 3 lb 09 oz. 1st - Ian Russell - 6 lb 04 oz - 3 fish. 2nd - Neil Inglis - 5 lb 06 oz - 3 fish. 3rd - Denis Thompson - 3 lb 02 oz - 3 fish. 5th - Colin Stainthorpe - 1 lb 07 oz - 1 fish. 6th - Rob Allison - 0 lb 12 oz - 1 rockling. 7th - William Atkinson - 0 lb 11 oz - 1 rockling. The continuing south easterly sea swell provided good fishing for the WSAA club and non club members for the whole week . Whitby Sea Anglers Association match, fished with a very strong wind on a flooding tide produced the best sized cod of the season 10 lb 14 oz from Ian Russell, a 6 lb 08 oz cod from Neil Inglis and 21 lb 14 oz bag from Denis Thompson. There was also a personal best from Mike Vasey 9 lb 00 oz, while out fishing out of a club match on Saturday evening. 1st - Denis Thompson - 21 lb 14 oz - 7 fish. 2nd - Ian Russell - 15 lb 08 oz - 5 fish. 3rd - Neil Inglis - 7 lb 12 oz - 2 fish. 4th - Rob Allison - 5 lb 12 oz - 2 fish. 5th - Mike Vasey - 5 lb 09 oz - 3 fish. 6th - George Middlemas - 5 lb 08 oz - 2 fish. 7th - Bernard Vasey - 5 lb 00 oz - 2 fish. 9th - Colin Stainthorpe - 0 lb 08 oz - 1 fish. Brown murky water surrounded the coastline as mud was washed from cliffs and rivers due to the heavy rain throughout Sunday. The high tide to ebb matchresulted in poor catches even with a good south easterly rough sea swell still running, with this loose weed was also a problem, only 4 codlings and a rockling were weighed in, from 4 members. 1st - Neil Inglis - 3 lb 07 oz - 2 fish. 2nd - Bernard Vasey - 2 lb 02 oz - 1 fish. 3rd - William Atkinson - 1 lb 12 oz - 1 fish. 4th - Mathew Atkinson - 0 lb 08 oz - 1 rockling. 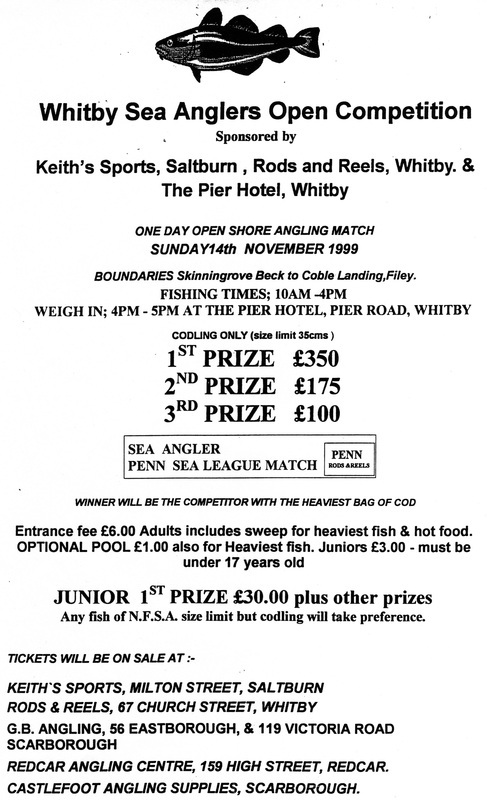 Whitby Sea Anglers Association annual Open 14th November 1999. The south easterly sea swell had fallen away for Whitby Sea Anglers Association, as they were fishing a 6 metre high tide and a bright full moon reflected in the calm sea water. Once again catches were low as small codling, the heaviest of 3 lb 03 oz from Denis Thompson were weighed in. 1st - Jimmy Middlemas - 4 lb 06 oz - 3 fish, his first match this seson. 2nd - Denis Thompson - 3 lb 12 oz - 2 fish. 3rd - George Middlemas - 2 lb 04 oz - 1 fish. 4th = Dave Perrett - 1 lb 08 oz - 1 fish. 4th = Phil Mead - 1 lb 08 oz - 1 fish. 6th - Paul Kilpatrick - 0 lb 12 oz - 1 fish. 7th - Mathew Atkinson - 0 lb 11 oz - 1 fish. 8th - Neil Inglis - 0 lb 08 oz - 1 fish. A very strong south westerly wind kept the sea conditions calm for the 4 hr match for Whitby Sea Anglers Association, with the half flooding tide, the wind spoiled the cliff marks for casting. A variety of small codling, billet, rockling and a pouting from Dave Perrett were weighed in. 1st - Neil Inglis - 5 lb 09 oz - 5 fish. 2nd - Phil Mead - 2 lb 06 oz - 2 fish. 3rd - William Atkinson - 1 lb 13 oz - 2 fish. 4th - Ian Russell - 0 lb 15 oz - 1 fish. 6th - Colin Stainthorpe - 0 lb 09 oz - 1 fish. And £250 in tackle prizes for other places. The tide had just started to flood for the Whitby Sea Anglers Association members match on a very dark night and no sea swell, activity was very low and bites were few. Four codlings and 4 rocklings were weighed in. 1st - Glen Kilpatrick - 3 lb 02 oz - 2 codlings. 2nd - Neil Inglis - 1 lb 06 oz - 1 fish. 3rd - Ian Russell - 1 lb 05 oz - 1 fish. 4th - Mike Vasey - 0 lb 14 oz - 1 fish. 5th = Bernard Vasey - 0 lb 11 oz - 1 rockling. 5th = William Atkinson - 0 lb 11 oz - 1 rockling. 5th = Colin Stainthorpe - 0 lb 11 oz - 1 rockling. Friday and Saturday the weather produced gales and heavy rain from the north west which stirred the sea bed and brought fish close to shore to feed. The sea had calmed quite a lot for the Whitby Sea Anglers Association Sunday evening competition. 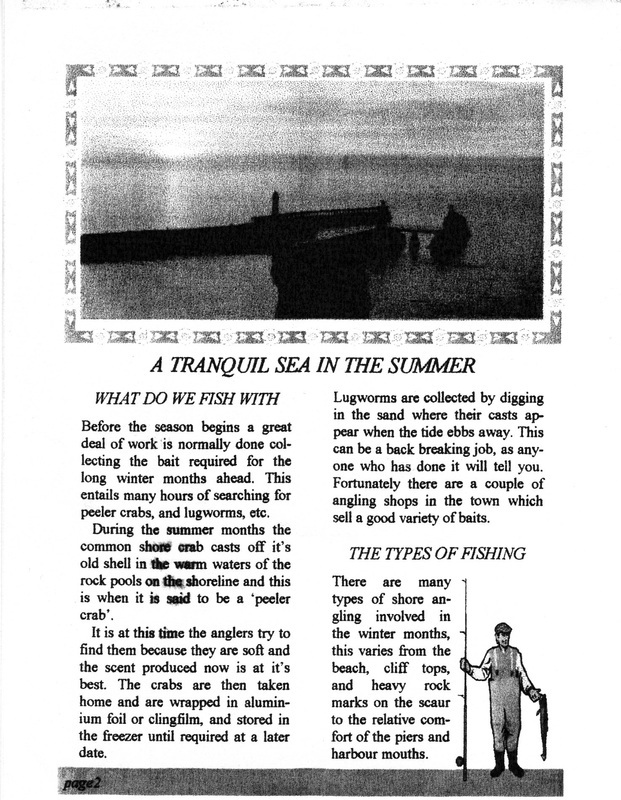 As the tide ebbed, anglers were able to choose a mark on the scars. 11 members returned with a total of 30 fish, most of which were fresh run, with the heaviest bag of 6 fish, 10 lb 03 oz for Denis Thompson. 1st - Denis Thompson - 10 lb 03 oz - 6 fish. 2nd - William Atkinson - 7 lb 10 oz - 3 fish. 3rd - Rob Allison - 7 lb 01 oz - 5 fish. 4th - Paul Kilpatrick - 5 lb 09 oz - 3 fish. 5th - Mathew Atkinson - 5 lb 01 oz - 3 fish. 6th - Ian Russell - 4 lb 14 oz - 3 fish. 7th - Colin Stainthorpe - 4 lb 01 oz - 2 fish. 8th - Mike Vasey - 2 lb 14 oz - 1 fish. 9th - Dave Perrett - 2 lb 06 oz - 2 fish. 10th = Ben Laws (Jnr) - 1 lb 14 oz - 1 fish. 10th = Philip Kilpatrick (Jnr) - 1 lb 14 oz - 1 fish. Fishing to a high tide ebbing with a slight close to shore sea swell, which resulted in 8 anglers weighing in 16 fish with a 2 lb 09 oz bass from Bernard Vasey and a personal best from Paul Dryden, with a cod of 5 lb 09 oz. 1st - Rob Allison - 7 lb 13 oz - 3 fish. 2nd - Colin Stainthorpe - 7 lb 06 oz - 3 fish. 3rd - Paul Dryden - 5 lb 09 oz - 1 fish. 4th - Neil Inglis - 4 lb 00 oz - 1 fish. 5th - William Atkinson - 3 lb 13 oz - 2 fish. 6th - Bernard Vasey - 3 lb 09 oz - 2 fish. 7th - Dave Perrett - 3 lb 02 oz - 1 fish. 8th - Phil Mead - 1 lb 13 oz - 1 fish. ​There was plenty of sea swell but not enough colour in the water with a strong wind presence for the WSAA Annual Open Shore angling competition. The six hour match fished from 10am to 4pm along the coast from Skinningrove Beck to Coble Landing, Filey attracted 142 anglers, 8 were juniors, with a result of 63 fish for a total weight of 256 lb 06 oz with plenty of fish in the 4 lb to 5 lb range, 8 anglers having double figure bags. 28th - D Warderall - 1 lb 05 oz - 1 fish. 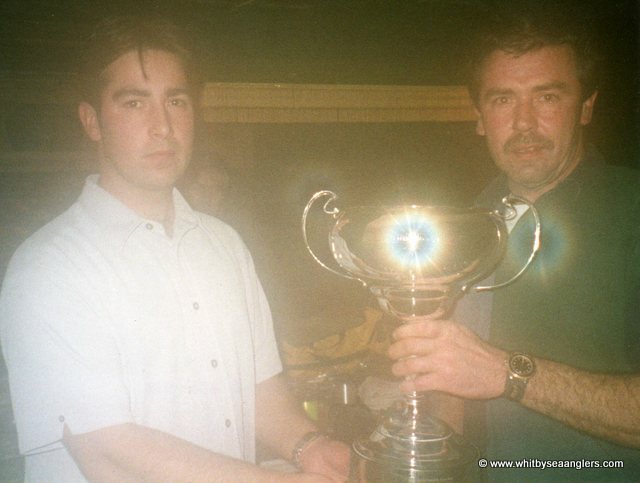 Neil Inglis presents Denis Thompson, 44 lb 13 oz, with the WSAA Open Trophy. Photograph by Bernard Vasey. Neil Inglis presents Andrew Woodhall, 8 lb 13 oz, with the WSAA Heaviest Fish Trophy. Photograph by Bernard Vasey. Neil Inglis presents Junior Winner, Michael Readman, 1 lb 06 oz, with £30. Photograph by Bernard Vasey. 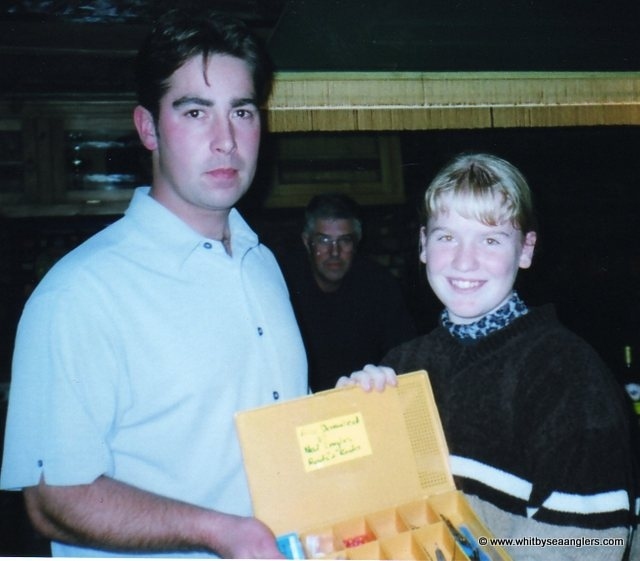 Neil Inglis presents Jessica Barker with a tackle box. Photograph by Bernard Vasey. Denis Thompson holding his best 2 of 13 fish for 44 lb 13 oz. Photograph by Bernard Vasey. 23 fish for 76 lb 02 oz. 14 members entered and 8 weighed in. John Smiths Open, Filey 11am to 4pm. It was a night to remember for junior angler Richard Parkin (Jnr) as he picked the right mark and time in Whitby Sea Anglers Association 3 hr match. There was a growing northerly swell on a flooding tide which brought the fish in to feed, 9 members returned with fish but the heaviest bag was weighed in by Rob Parkin (Jnr), who won the match with 14 lb 06 oz - 5 codlings, one of 5 lb 13 oz. This his best nights fishing in the club. 1st - Rob Parkin (Jnr) - 14 lb 06 oz - 5 codlings. Rob Allison caught one of 7 lb 07 oz which is now the heaviest fish for Novembers sweep and his personal best. 2nd - Rob Allison - 14 lb 01 oz - 3 fish, with one of 7 lb 07 oz. 3rd - Phil Mead - 6 lb 10 oz - 3 fish. 4th - Denis Thompson - 2 lb 13 oz - 1 fish. 5th - Denis Thompson - 2 lb 11 oz - 1 fish. 6th - Colin Stainthorpe - 2 lb 03 oz - 1 fish. 7th - Neil Inglis - 2 lb 01 oz - 1 fish. 8th - Glen Kilpatrick - 1 lb 08 oz - 1 fish. 9th - Paul Kilpatrick - 1 lb 04 oz - 1 fish. The sea had calmed for Sundays Whitby Sea Anglers Association match as the tide ebbed, anglers were able to follow it out casting out into the runs and eventually reach the tangles at low water, but it was a quiet night as only 9 fish were weighed in, 3 billets and 6 codlings. 1st - Dave Perrett - 5 lb 06 oz - 1 fish. 2nd - Jimmy Middlemas - 5 lb 03 oz - 1 fish. 3rd - Glen Kilpatrick - 3 lb 05 oz - 2 fish. 4th - William Atkinson - 2 lb 03 oz - 1 fish. 5th - Ben Laws - 1 lb 05 oz - 1 fish. 6th - Philip Kilpatrick (Jnr) - 1 lb 14 oz - 1 fish. 7th - Rob Allison - 1 lb 02 oz - 1 fish. 8th - Neil Inglis - 1 lb 00 oz - 1 fish. The mid week match for Whitby Sea Anglers Association was a quiet evening as there were only 2 codlings and a billet weighed in. The sea state was calm as the 6 metre tide ebbed out on a dry windless night. 1st - Phil Mead - 2 lb 00 oz - 1 fish. 2nd - George Middlemas - 1 lb 10 oz - 1 fish. 3rd - Rob Parkin (Jnr) - 1 lb 03 oz - 1 billet. It was 2 hrs before high water when the match started for Whitby Sea Anglers Association and the sea swell had grown but there was a very strong wind presence which spoiled the choice of where to fish in comfort and this resulted in yet another low showing of fish. Dave Perrett caught his winning fish in the last ½ hr of the match. 1st - Dave Perrett - 5 lb 03 oz - 2 codlings. 2nd - Mike Vasey - 2 lb 11 oz - 1 fish. 3rd = Ian Russell - 2 lb 00 oz - 1 fish. 3rd = Phil Mead - 2 lb 00 oz - 1 fish. 5th - William Atkinson - 0 lb 08 oz - 1 rockling. 6th - Colin Stainthorpe - 0 lb 07 oz - 1 rockling. Cloughton Open 12th December 1999. First prize £250 - this is a club day match. Whitby Sea Anglers Association had a good nights fishing although the match was fished with strong winds and north westerly sea swell provided a lot better sized fish to the scales. 13 fish were caught as the tide flooded in, with the heaviest fish weighing 5 lb 05 oz from Denis Thompson but Dave Perrett has found his form, winning the match with 7 lb 03 oz, one of 4 lb 12 oz. 1st - Dave Perrett - 7 lb 03 oz - 2 fish. 2nd - Denis Thompson - 5 lb 05 oz - 1 fish. 3rd - George Middlemas - 4 lb 12 oz - 1 fish. 4th - Jimmy Middlemas - 4 lb 00 oz - 2 fish. 5th - Phil Mead - 3 lb 14 oz - 2 fish. 6th - Neil Inglis - 2 lb 06 oz - 1 fish. 7th - Rob Parkin (Jnr) - 2 lb 02 oz - 1 fish. 8th = Glen Kilpatrick - 2 lb 01 oz - 1 fish. 8th = Colin Stainthorpe - 2 lb 01 oz - 1 fish. 10th - Ian Russell - 1 lb 08 oz - 1 fish. Almost the same conditions as Wednesday with the tide ebbing and plenty of colour in the water the 4 hr match for Whitby Sea Anglers Association produced the best nights fishing result this season, a total of 32 fish weighing in at 85 lb 09 oz. Three double figure bags , 2 good sized fish, one of 8 lb 14 oz from Ian Russell to set the target for the heaviest fish sweep competition, a 7 lb 01 oz cod to Phil Mead and 2 cod of 6 lb for Jimmy Middlemas. 1st - Ian Russell - 17 lb 03 oz - 5 fish. 2nd - Jimmy Middlemas - 12 lb 01 oz - 2 fish. 3rd - Phil Mead - 11 lb 04 oz - 2 fish. 4th - Neil Inglis - 7 lb 13 oz - 4 fish. 5th - George Middlemas - 7 lb 05 oz - 5 fish. 6th - Colin Stainthorpe - 6 lb 05 oz - 3 fish. 7th - Rob Allison - 5 lb 14 oz - 3 fish. 8th - Bernard Vasey - 5 lb 10 oz - 3 fish. 9th - Ben Laws - 3 lb 05 oz - 1 fish. 10th - Rob Parkin (Jnr) - 2 lb 03 oz - 1 fish. 11th - Dave Perrett - 2 lb 03 oz - 1 fish. 12th - Paul Kilpatrick - 1 lb 05 oz - 1 fish. 13th - Mike Vasey - 1 lb 02 oz - 1 fish. The club match for Whitby Sea Anglers Association was fished to a half ebbing tide with a good sea swell, but strong gusting winds spoiled the choice of marks they could cast and fish. Four members managed to return with fish, the winner with 2 fish for 3 lb 02 oz was Denis Thompson. 1st - Denis Thompson - 3 lb 02 oz - 2 fish. 2nd - Dave Perrett - 2 lb 15 oz - 1 fish. 3rd - Ian Russell - 2 lb 02 oz - 2 fish. 4th - William Atkinson - 1 lb 10 oz - 1 fish. The Annual Cloughton Sea Angling Open competition with the fishing time from 10am to 4pm and weigh in at the Red Lion in Cloughton. Over 100 anglers took part as they fished a north westerly growing sea swell which surged as the tide ebbed, not reaching its low water mark, there was also heavy rain showers for the first 3 hrs of the match. This years winner of the £250 first place prize came from Durham, J Greaves with the heaviest single fish of 7 lb 07 oz. A close second was Philip France, of Cloughton, 7 lb 06 oz winning £100. Third place and £50 to A Parkin 7 lb 04 oz. 1st - J Greaves - 7 lb 07 oz. 2nd - Philip France - 7 lb 06 oz. 3rd - A Parkin - 7 lb 04 oz. 4th - R Lamb - 6 lb 09 oz. 5th - Roy Cammish - 6 lb 01 oz. 6th - Neil Inglis - 5 lb 11 ¾ oz. 7th - P Lee - 5 lb 11 ½ oz. 8th - Mick Chadwick - 5 lb 11 ¼ oz. 9th - Mark Wilding - 5 lb 04 oz. 10th - Eric Thompson - 4 lb 15 oz. 11th - Dave Perrett - 4 lb 10 oz, he also had 2 other fish 4 lb 05 oz and 1 lb 14 oz. 1st - Dave Perrett - 10 lb 13 oz - 3 fish. 2nd - Rob Allison - 7 lb 10 oz - 2 fish. 3rd - Neil Inglis - 5 lb 12 oz - 1 fish. 4th - George Middlemas - 1 lb 08 oz - 1 fish. 5th - William Atkinson - 1 lb 03 oz - 1 fish. 12 members entered and 5 weighed in. 10 lb 13 oz - 3 fish. 5 lb 12 oz - 1 fish. 1 lb 03 oz - 1 fish. 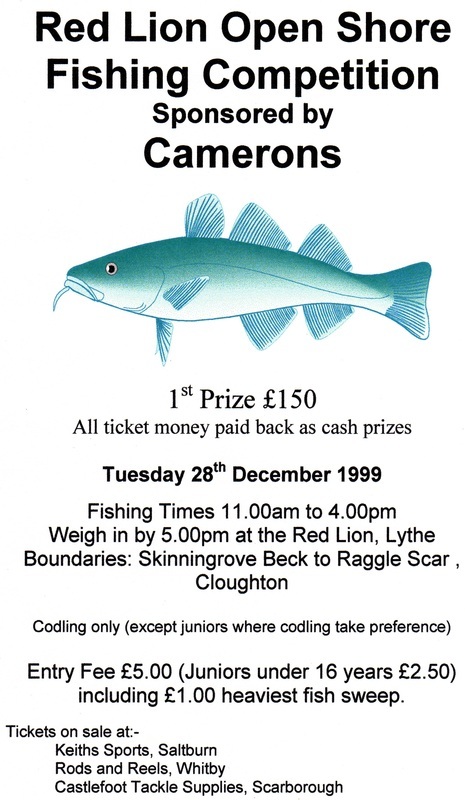 26th December 1999 Redcar Xmas Angling Centre Open. 28th December 1999 Red Lion Open, Lythe. 3rd January 2000 Redcar Navy & Gentlemans Club. 9th January 2000 Saltburn& District Open. There were only 6 fish weighed in for the Whitby Sea Anglers Association members match, two of these were caught by Dave Perrett, one 7 lb 09 oz and the second 6 lb 03 oz, which won him the match. 1st - Dave Perrett - 13 lb 12 oz - 2 codlings. 2nd - Phil Mead - 4 lb 15 oz - 1 codling. 3rd - Neil Inglis - 3 lb 06 oz - 2 codlings. 4th - George Middlemas - 1 lb 11 oz - 1 codling. ​Fishing an ebbing tide 2pm to 7pm, Saturday nights sea turned into a growing north north westerly sea swell which gave very rough conditions with too much white water also a strong wind was present along with light snow showers, once aging the selection of a mark to fish was limited, as the tide ebbed anglers were able to go onto the scars and fish the runs. 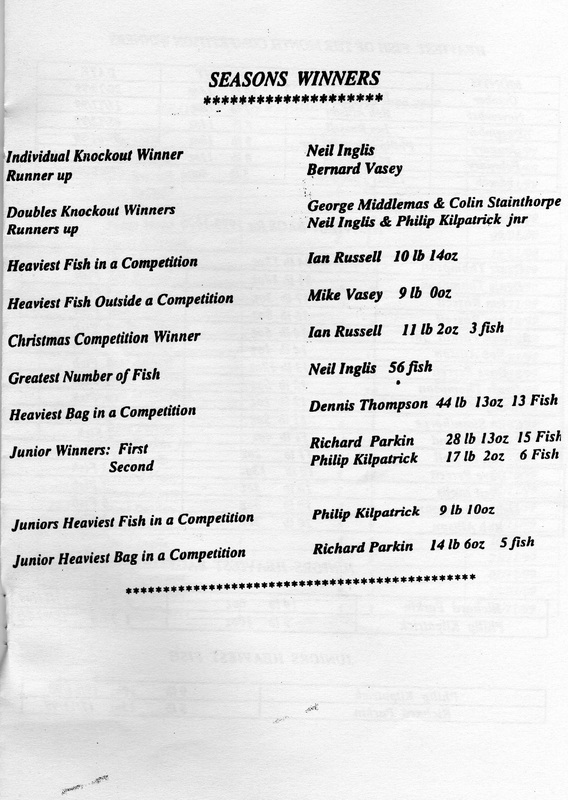 Ian Russell won the Christmas Match Trophy and Denis Thompson won the Heaviest Fish Trophy although Ian Russell had a heavier single fish. 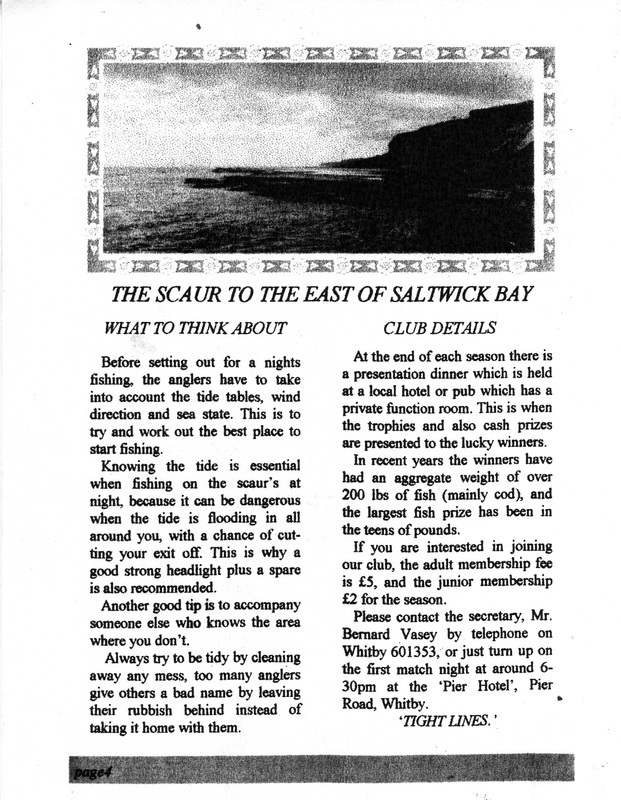 Whitby Sea Anglers Association rules dictate only one trophy can be won by a member. 1st - Ian Russell - 11 lb 02 oz - 3 codlings, one of 7 lb 13 oz. 2nd - Dave Perrett - 8 lb 01 oz - 2 codlings. 3rd - Denis Thompson - 5 lb 01 oz - 1 codling. 4th - Paul Kilpatrick - 2 lb 15 oz - 3 codlings. 5th - Rob Allison - 2 lb 06 oz - 1 codling. 6th - Phil Mead - 2 lb 01 oz - 1 codling. 7th - William Atkinson - 1 lb 14 oz - 1 codling. 12 members entered and 7 weighed in 12 fish for 33 lb 08 oz. 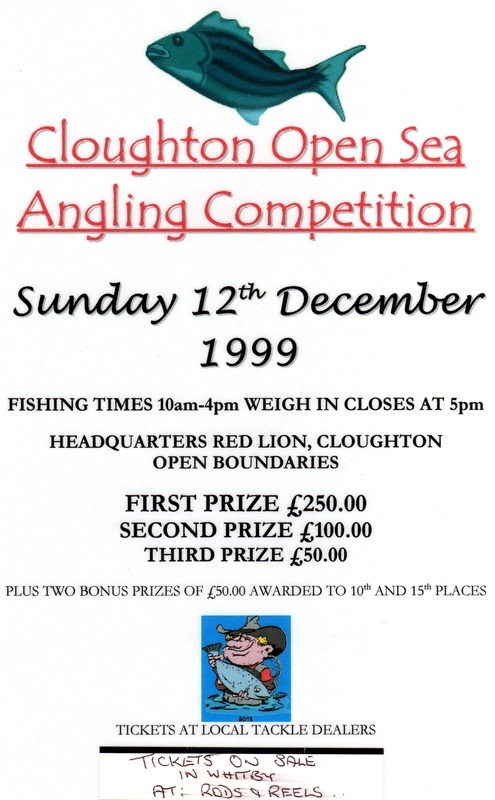 Redcar Angling Centre Open - 26th December 1999. There were two open match competitions during the festive break, the first was the Redcar Angling Centre Open which was sponsored by Dave Turnbull of the Redcar Angling Centre. 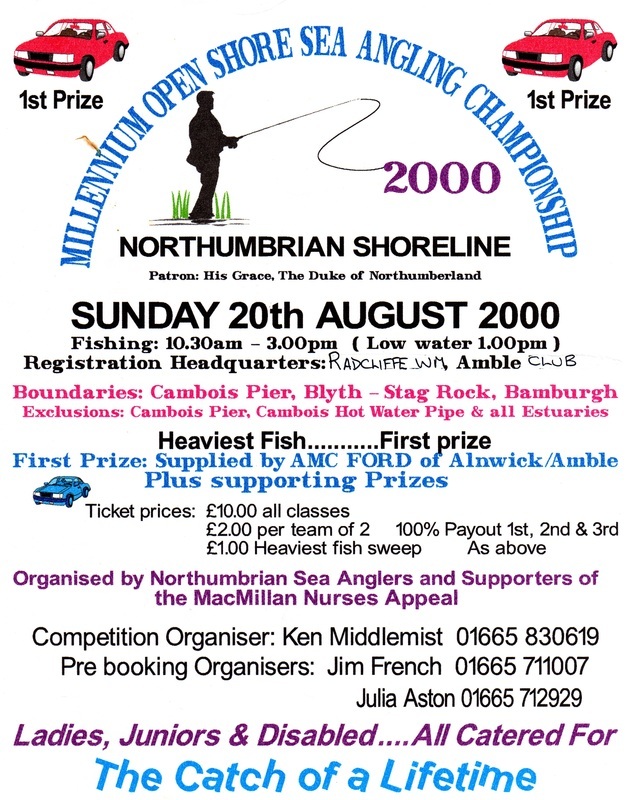 The match was fished on the 26th December 1999, to a low water into flooding tide with 78 anglers taking part, 17 weighed in a total of 92 lb of fish. The winner of the match with the heaviest bag of cod went to Chris Scaife, of Filey with 15 lb 04 oz. The heaviest fish sweep was won by Bernard Westgarth 7 lb 11 oz. 1st - Chris Scaife - 15 lb 04 oz. 2nd - Paul Medd - 12 lb 12 oz. 3rd - Bernard Westgarth - 10 lb 10 oz. 4th - Brian Harland - 10 lb 08 oz. 5th - Matthew Garbutt - 7 lb 06 oz. 6th - P Trainer - 6 lb 08 oz. 7th - J Ward - 6 lb 00 oz. 8th - P Little - 4 lb 15 oz. 9th - J Dobie - 3 lb 07 oz. 10th - Daniel Redling - 2 lb 12 oz. 11th - J Wilson - 2 lb 11 oz. 12th - A Barker - 2 lb 09 oz. 13th - G Jackson - 2 lb 02 oz. 14th - C Pack- 1 lb 14 oz. 15th - W Harriman - 1 lb 07 oz. 16th - G Mason - 1 lb 05 oz. 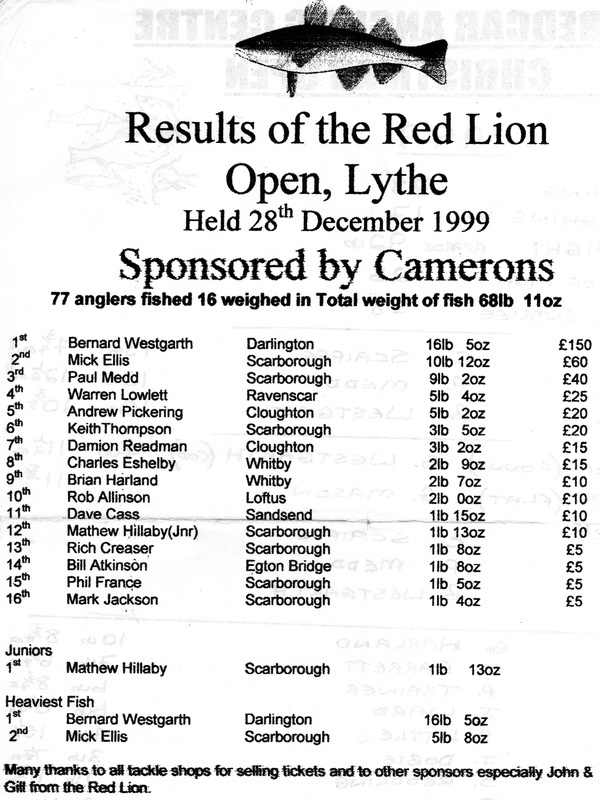 The second, the Red Lion Open Angling Competition was fished on the 28th December 1999, thanks to John and Gill of the Red Lion in Lythe with the main sponsors Camerons. A total of 77 anglers entered the event with 16 anglers weighing in a total weight of 68 lb 11 oz. 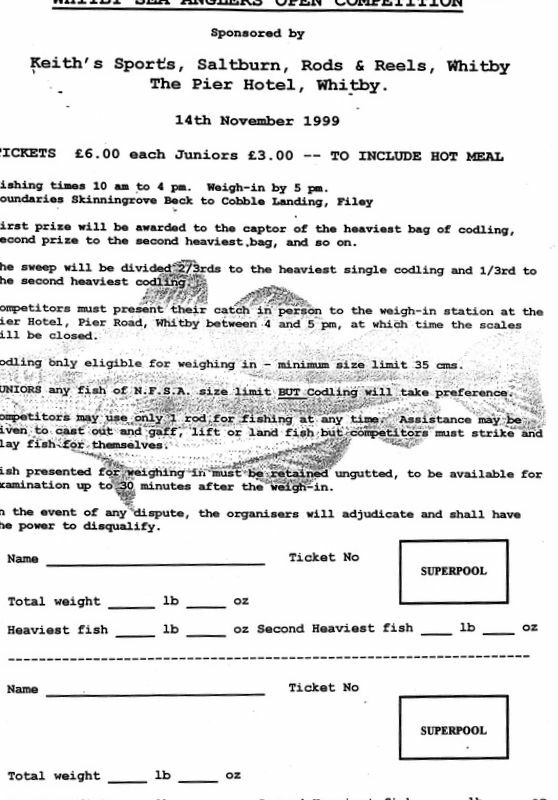 The first place prize of £150 for the heaviest bag of fish was won by a single fish of 16 lb 05 oz caught by Bernard Westgarth, of Darlington. Second place and £60 to Mick Ellis, of Scarborough 10 lb 12 oz, 2 fish. Third place and £40 to Paul Medd, of Scarborough 9 lb 02 oz, 3 fish. The sweep for the heaviest fish was won by Bernard Westgarth 16 lb 05 oz. Second heaviest fish Mick Ellis 5 lb 08 oz. The winner of the Junior section, also from Scarborough was Matthew Hillaby with a cod of 1 lb 13 oz. 1st - Bernard Westgarth - 16 lb 05 oz. 2nd - Mick Ellis - 10 lb 12 oz. 3rd - Paul Medd - 9 lb 02 oz. 4th - Warren Lowlett - 5 lb 04 oz. 5th - Andrew Pickering - 5 lb 02 oz. 6th - Keith Thompson - 3 lb 05 oz. 7th - Damion Readman - 3 lb 02 oz. 8th - Charles Eshelby - 2 lb 09 oz. 9th - Brian Harland - 2 lb 07 oz. 10th - Rob Allison - 2 lb 00 oz. 11th - Dave Cass - 1 lb 15 oz. 12th - Mathew Hillaby (Jnr) - 1 lb 13 oz. 13th - Rich Creaser - 1 lb 08 oz. 14th - William Atkinson - 1 lb 08 oz. 15th - Phil France - 1 lb 05 oz. 16th - Mark Jackson - 1 lb 04 oz. Photograph of Bernard Westgarth winner of the Red Lion Open with his cod of 16 lb 05 oz. 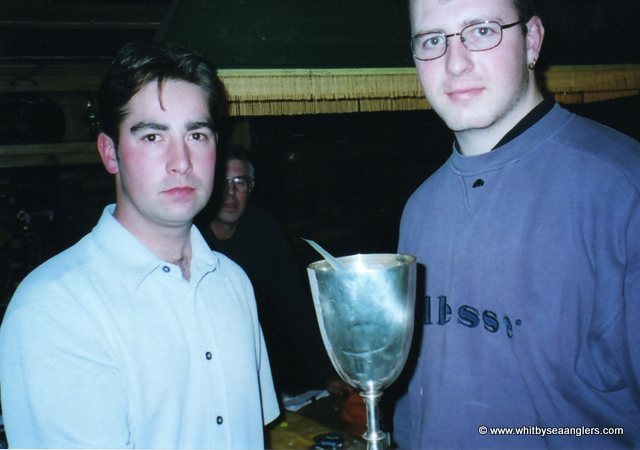 Bernard Westgarth, Red Lion Open winner, 28th December 1999. 16 lb 05 oz. Photograph by Bernard Vasey. 1st - William Atkinson - 9 lb 12 oz - 2 fish, one of 8 lb. 2nd - Paul Kilpatrick - 8 lb 12 oz - 1 fish, heaviest fish sweep leader for January. 3rd - George Middlemas - 5 lb 14 oz - fish. 4th - Denis Thompson - 0 lb 15 oz - 1 billet. Whitby Sea Anglers Association fished a high water to ebb match on a very wet night which resulted in a win for Phil Mead. 1st - Phil Mead - 4 lb 00 oz - 1 fish. 2nd - George Middlemas - 2 lb 04 oz - 1 fish. 3rd - Rob Parkin (Jnr) - 1 lb 02 oz - 1 billet. The Ship Inn open Angling Competition with the new main sponsors Tetley’s for the heaviest single cod was fished by 109 anglers. They were fishing a north westerly sea swell to an ebbing tide on a clear wind free day from 1pm to 6pm, which resulted in 25 fish being weighed in for a total weight of 69 lb 10 oz. 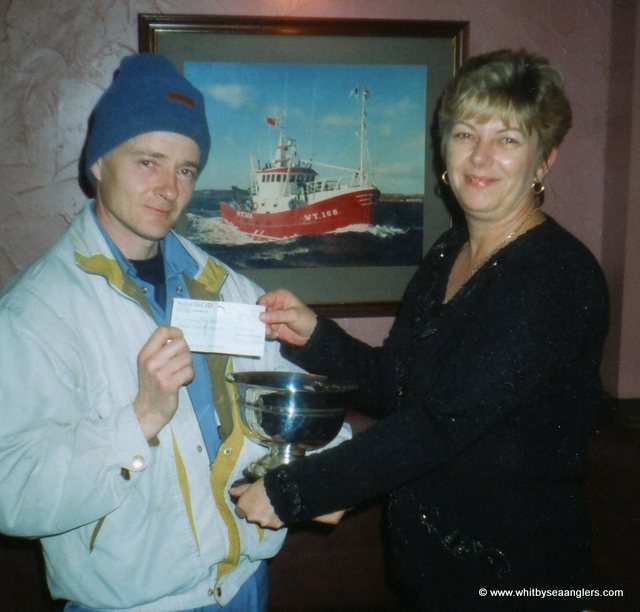 The first prize of £300 and the Whitby Gazette Rose Bowl Trophy was awarded to a local angler Brian Harland by the landlady Barbara Tyler of the Ship Inn weighing in a single cod of 6 lb 07 oz. Second prize of £150 to George Hicks, of Scarborough 6 lb 02 oz. Third prize of £75 to Andrew Woodall, of Scarborough 6 lb 01 ½ oz. The prize of £25 for the heaviest bag of codling was also won by Brian Harland with 2 fish for 8 lb 12 oz. The junior event also had a good result as Mathew Hillaby, of Scarborough won a quality sea reel donated by Whitby Angling for first prize with a codling of 1 lb 15 ½ oz. Second prize of £25 to Atalya Barker with a flounder 1 lb 04 ½ oz. Third place was Richard Parkin (WSAA Jnr) 0 lb 09 oz (rockling). Bernard Vasey 17th January 2000. 1st - Brian Harland - 6 lb 07 oz. 2nd - George Hicks - 6 lb 02 oz. 3rd - Andrew Woodall - 6 lb 01½ oz. 4th - John Ward - 5 lb 07 oz. 5th - Paul Short - 5 lb 04 oz. 6th - Denis Thompson - 3 lb 02½ oz. 7th - Harry Cook - 3 lb 00 oz. 8th - M Thompson - 2 lb 09 oz. 9th - Phil Mead - 2 lb 08 oz. 10th - Phil Mead - 2 lb 05 oz. 11th = Colin Stainthorpe - 2 lb 05 oz. 11th = Brian Harland - 2 lb 05 oz. 13th = Dave Cass - 2 lb 02 oz. 13th = Pete Bayes - 2 lb 02 oz. 16th = Andrew Cass - 2 lb 01 oz. 16th = Philip France - 2 lb 01 oz. 19th - Andrew Woodall - 1 lb 15 oz. 20th - Phil Mead - 1 lb 14 oz. 21st - Harry Cook - 1 lb 13 oz. Heaviest bag of fish Brian Harland 8 lb 12 oz - 2 fish. 1st - Mathew Hillaby - 1 lb 15½ oz. 2nd - Atalya Barker - 1 lb 04½ oz. 3rd - Rob Parkin - 0 lb 09 oz - fish. 12 WSAA members entered and only 3 weighed in!! 6 lb 11 oz - 3 fish. 3 lb 03 oz - 1 fish. 2 lb 05 oz - 1 fish. Whitby Sea Anglers Association club match produced 3 good fish to the scales from a north westerly ebbing tide sea swell, on a dry night which resulted in 15 fish being weighed in from 9 members. 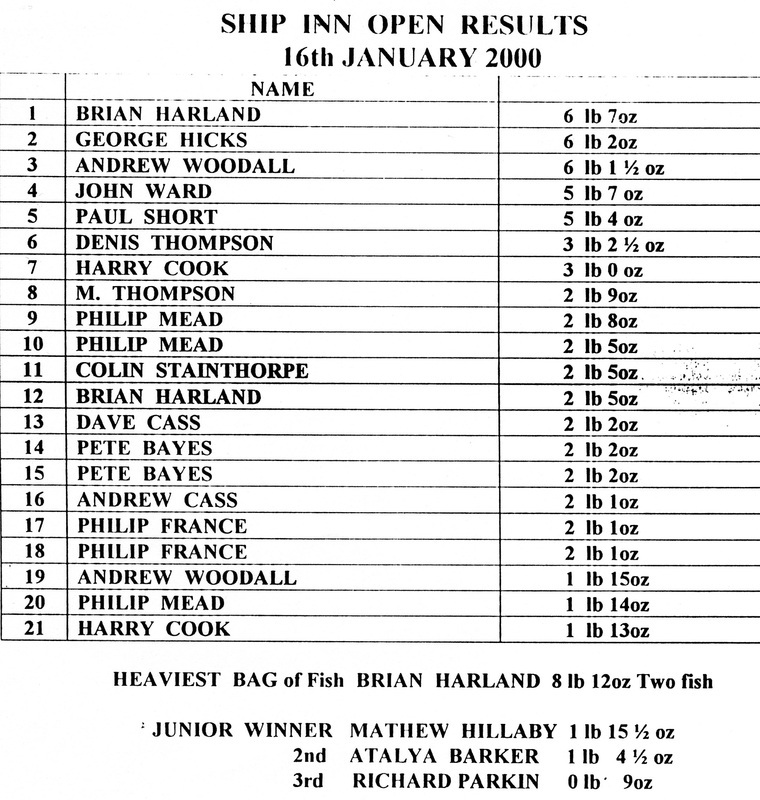 Philip Kilpatrick (Jnr) lost a good fish in the Ship Inn Open competition but in this club match he weighed in a 9 lb 10 oz cod which did not get away, this is now the fish to beat in the heaviest fish of the month competition for January. 1st - Neil Inglis - 10 lb 03 oz - 3 fish, one of 8 lb 01 oz - his best this season. 2nd - Philip Kilpatrick (Jnr) - 9 lb 10 oz - 1 fish. 3rd - Rob Allison - 8 lb 14 oz - 2 fish, one of 6 lb 08 oz. 4th - George Middlemas - 5 lb 12 oz - 3 fish. 5th - William Atkinson - 3 lb 15 oz - 2 fish. 6th - Bernard Vasey - 1 lb 11 oz - 1 fish. 7th - Colin Stainthorpe - 1 lb 05 oz - 1 fish. 8th - Ian Russell - 0 lb 14 oz - 1 fish. 9th - Mathew Atkinson - 0 lb 11 oz - 1 fish. The winners of the Bell were Scarborough Rock Anglers Club, Whitby Sea Anglers Association managed to be fifth place. There was a good north westerly sea swell which produced a few better fish than in previous years, with the heaviest bag of fish caught by Ray Maddison of 15 lb, the heaviest fish was from a Whitby Sea Angler George Middlemas 6 lb 09 oz . The mid week match for Whitby Sea Anglers Association was fished to a high tide and a calm sea, as the north westerly swell the previous weekend which had brought in a few good fish, fell away to leave only a little movement close to shore. It was a dry night as only 4 fish were returned to the scales, there were 2 winners as Ian Russell and William Atkinson weighed in identical codlings of 4 lb 01 oz, from almost the same mark. 1st - William Atkinson - 4 lb 01 oz - 1 fish. 1st = Ian Russell - 4 lb 01 oz - 1 fish. 3rd - Phil Mead - 2 lb 09 oz - 1 fish. 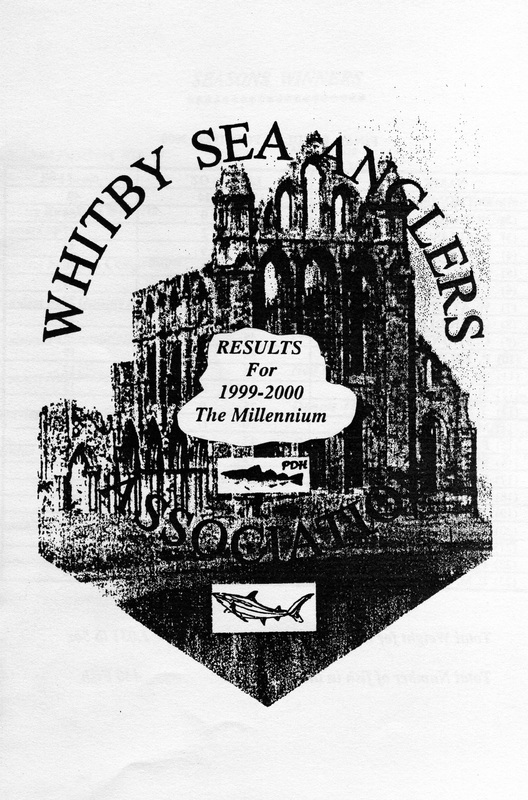 Starting at 6pm Whitby Sea Anglers Association members 4 hr match the tide was at full ebb for the start, with a strong west south westerly wind blowing and once again finding a mark to fish on the open scar was a problem. 1st - Rob Allison - 10 lb 03 oz - 2 fish, one of 6 lb 12 oz. 2nd - Neil Inglis - 5 lb 08 oz - 1 fish. 3rd - Paul Kilpatrick - 2 lb 10 oz - 1 fish, this fish was hooked and played by Richard Parkin (Jnr) but he lost his trace and hook while reeling it in, Paul returned his trace but kept the fish. The sea conditions were quite good, the wind held off on a dry night as members of Whitby Sea Anglers Association fished a half ebbing tide to a slight north westerly sea with long distance swells running to create plenty of movement for the fish to search for food. The night resulted in a total of 7 fish from 6 anglers. 1st - Bernard Vasey - 8 lb 04 oz - 2 fish, one of 4 lb 11 oz. 2nd - Dave Perrett - 4 lb 05 oz - 1 fresh run codling. 3rd - Neil Inglis - 2 lb 10 oz - 1 fish. 4th - Rob Allison - 2 lb 07 oz - 1 fish. 5th = Mike Vasey - 1 lb 10 oz - 1 fish. 5th = Phil Mead - 1 lb 10 oz - 1 fish. A calm sea as fished by Whitby Sea Anglers Association members, fishing to an ebbing tide, the wind had returned and made it a very unpleasant night. Only 2 fish were caught. 1st - Neil Inglis - 2 lb 12 oz - 1 fish. 2nd - Paul Kilpatrick - 0 lb 15 oz - 1 fish. 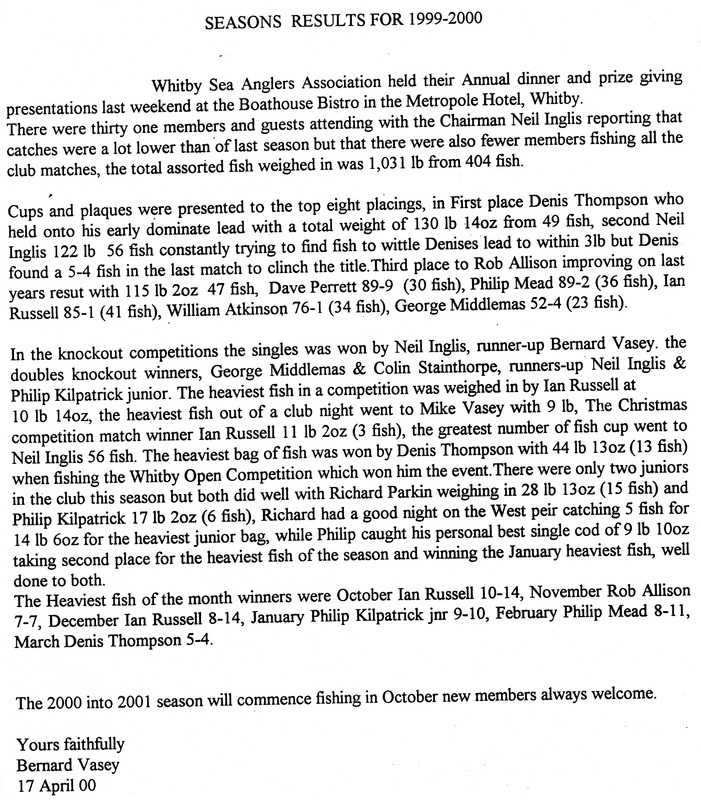 Although there was a descent sea state for the mid week Whitby Sea Anglers Association match, only 3 fish were weighed in. It was a high water ebbing tide with the sea swell running from a north westerly direction on a fine night with very light wind, but only 2 members weighed in. 1st - Denis Thompson - 2 lb 10 oz - 1 fish. 2nd - Dave Perrett - 2 lb 08 oz - 2 fish. The conditions were much the same as in last Wednesdays mid week match only fished to a flooding tide in which there was a long wait for Phil Mead that paid off as he fished the 4 hr match to catch an 8 lb 11 oz cod on his final cast, now the heaviest fish of the month so far February. 1st - Phil Mead - 8 lb 11 oz - 1 fish. 2nd - Rob Allison - 3 lb 02 oz - 2 fish. 3rd - Dave Perrett - 2 lb 07 oz - 1 fish. 4th - Bernard Vasey - 1 lb 10 oz - 1 fish. Whitby Sea Anglers Association fished a low water flooding tide, the sea was calm on a dry windless night with a very keen frost making it the coldest nights fishing this season. Two members caught codlings on their first casts, William Atkinson won the match. 1st - William Atkinson - 3 lb 02 oz - 1 fish. 2nd - Phil Mead - 3 lb 00 oz - 1 fish. This was the first time this season that no fish were weighed in, the scales were not required. There was a descent sea swell but when the 5.8 metre tide began to ebb it went out at a fast rate, possibly taking the fish out with it. Whitby Sea Anglers Association fish to the end of March in which time there is still time to catch the fish of the season as large fish come in to spawn before leaving for deeper water. Neil Inglis and Bernard Vasey both had fish of 28 lb and 20 lb respectively, at around this time of the year even on a calm night there is still a chance for a “tight liner”. The wind was still in the south westerly direction which kept the sea calm for the evenings Whitby Sea Anglers Association 3 hr match. Casting in 2 hrs into an ebbing high water tide this prime time for codling to look for food and only 1 fish was brought to the scales. Paul Kilpatrick ventured to Filey Brigg and returned with a 1 lb 09 oz codling to win. It was a very quiet night and William Atkinson was the only member to return to the scales with a solitaire rockling for 0 lb 09 oz. A strong wind persisted all day but it did ease down to be able to fish the match. The sea was rough for the Whitby Sea Anglers Association evening match as a much welcomed north westerly sea swell changed the calm conditions of late. The match was fished to low water into a flooding tide, even with a good sea catches were still low which resulted in a win for Dave Perrett. 1st - Dave Perrett - 3 lb 10 oz - 1 fish. 2nd - Phil Mead - 2 lb 00 oz - 1 fish. 3rd - Paul Kilpatrick - 1 lb 14 oz - 1 fish. The competition still had the north westerly sea swell but along with it a strong wind made it difficult for casting. This was an all ebbing tide and although only a 5.3 metre high it was going out fairly fast and surging at times. There were 7 fish weighed in, the most for some time. 1st - Rob Allison - 8 lb 13 oz - 2 fish, one of 4 lb 13 oz. 2nd - Neil Inglis - 6 lb 03 oz - 3 codlings and 1 rockling. 3rd - George Middlemas - 2 lb 01 oz - 1 fish. 4th - Phil Mead - 1 lb 13 oz - 1 fish. These results took 2 more anglers into the 100 lb weight, joining Denis Thompson who has got 125 lb 02 oz from 47 fish, Neil Inglis 105 lb 09 oz - 50 fish, Rob Allison - 100 lb 15 oz - 41 fish. Whitby Sea Anglers Association fished a west by north westerly sea swell with the tide almost 2 hrs into its ebb for the start of the competition but once again a strong wind limited some of the marks to fish. There were 4 fish weighed in , all over 2 lb with the winning fish weighing in at 3 lb 04 oz for Neil Inglis. 1st - Neil Inglis - 3 lb 04 oz - 1 fish. 2nd - William Atkinson - 2 lb 12 oz - 1 fish. 3rd - Rob Parkin (Jnr) - 2 lb 09 oz - 1 fish. 4th - Rob Allison - 2 lb 01 oz - 1 fish. The 4 hr match was fished to a high water tide with long distance running swells giving plenty of movement and colour close to shore, thankfully no wind for Whitby Sea Anglers Association members. Most anglers reported having small fish bites which explained why only 2 rocklings, 1 whiting were weighed in along side the only codling of 3 lb 02 oz of the night falling to Phil Mead. 1st - Phil Mead - 3 lb 02 oz - 1 codling. 2nd - Ian Russell - 0 lb 10 oz - 1 rockling. 3rd = Bernard Vasey - 0 lb 08 oz - 1 rockling. 3rd = George Middlemas - 0 lb 08 oz - 1 whiting. Last weekend the British Beach Open Championships were fished along the Holderness Coast, this was a two day event with the heaviest fish on the Sunday falling to R Wiley of Nafferton, 4 lb 09½ oz winning £1,5000, this was the best fish over the two days. The Sunday match was won by Paul Lee of Hartlepool weighing in at 4 lb 04 oz winning £1,500, best bag over the two day competition was won by J Porter, from Dewsbury with 6 lb 02 oz also winning £1,5000. The midweek match for Whitby Sea Anglers Association produced a 5 lb 01 oz cod caught by William Atkinson, now the heaviest fish of the month to date putting Rob Allisons fish of 4 lb 13 oz from the 5th March into second. There was a descent north by north westerly sea swell and fishing a flooding tide, William Atkinson could of won the match but lost a fish off earlier, it was Rob Allison who took the win. 1st - Rob Allison - 5 lb 03 oz - 2 fish. 2nd - Colin Stainthorpe - 1 lb 14 oz - 1 fish. 3rd - Phil Mead - 1 lb 01 oz - 1 fish. Almost a calm sea for the 4 hrs Whitby Sea Anglers Association evening match with movement close to shore as the tide ebbed fairly fast resulted in a total of 6 fish being weighed in, 2 codlings and 3 rocklings. Neil Inglis returned with the best bag as Phil Mead continues to find fish. 1st - Neil Inglis - 2 lb 05 oz - 1 fish. 2nd - Phil Mead - 1 lb 12 oz - 1 fish. 3rd - Dave Perrett - 1 lb 03 oz - 1 fish. 4th - William Atkinson - 1 lb 01 oz - 2 fish. 5th - George Middlemas - 0 lb 12 oz - 1 fish. 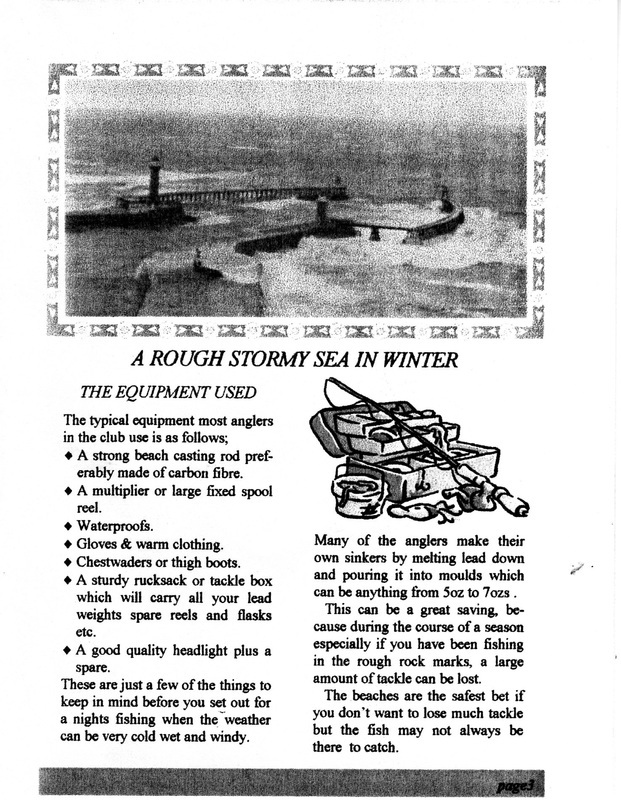 A north westerly sea swell failed to produce the quantity of fish that was hoped in Whitby Sea Anglers Association shore match, they were fishing an ebbing tide but the sea was too heavy at times due to the long distance running swells. There were only 2 anglers returning with fish, Neil Inglis kept his hopes of catching Denis Thompson seasonal weight by weighing in 3 codlings. 1st - Neil Inglis - 8 lb 06 oz - 3 fish, one of 3 lb 03 oz. 2nd - Rob Allison - 1 lb 13 oz - 1 fish. The wind increasing to strong and showery rain spoiled the nights fishing for Whitby Sea Anglers Associations penultimate match with a flooding tide the sea state was choppy but this did not seem to scare the rocklings as they made their presence with 4 being brought to the scales along with 3 codlings. 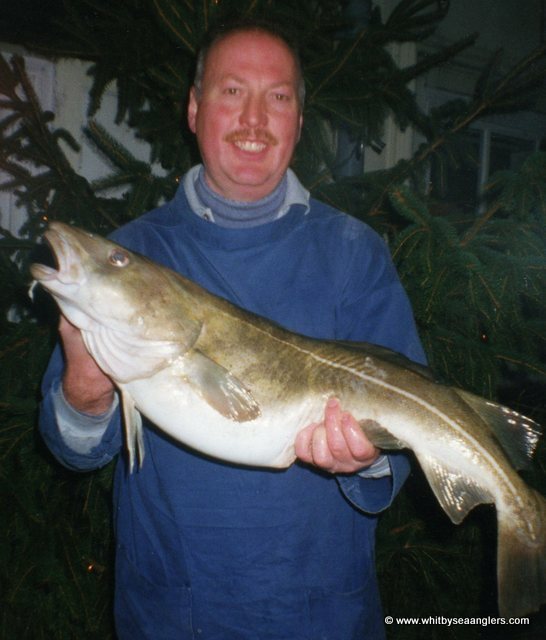 1st - Ian Russell - 4 lb 12 oz - 1 codling of 4 lb 12 oz and 2 rocklings. 2nd - Neil Inglis - 2 lb 08 oz - 1 fresh run codling. 3rd - Rob Allison - 1 lb 14 oz - 2 very good rocklings. 4th - Denis Thompson - 0 lb 08 oz - 1 rockling. 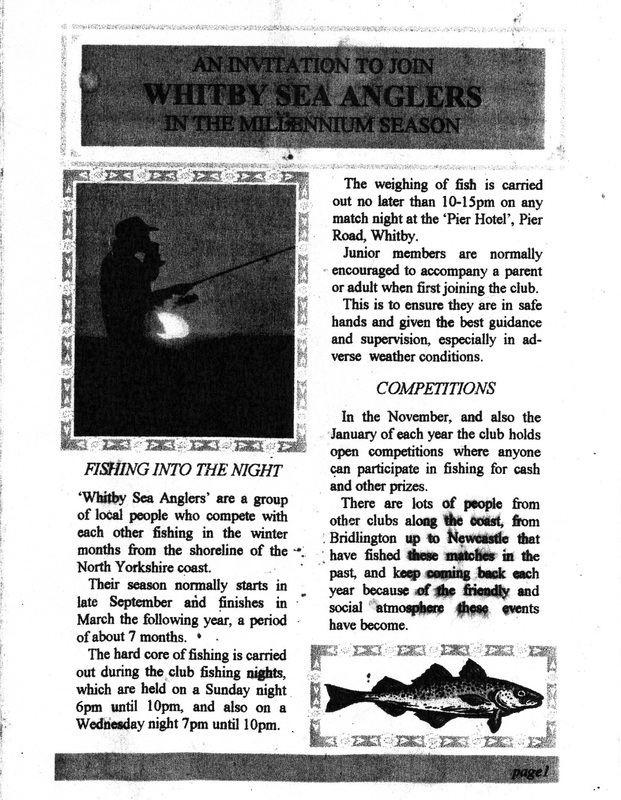 A cold night with a moderate north easterly swell was fished in the final match of the 1999 - 2000 Season for Whitby Sea Anglers Association. The sun still shone at the start of the competition and the water was quite clear even with the rough movement in the sea, with a slow flooding tide on a dry night 2 codlings were weighed in, one of 5 lb 04 oz, caught by Denis Thompson this fish not only confirming his win for the seasons total catch weight but also pipping William Atkinson’s cod of 5 lb 01 oz for the heaviest fish of the month for March. Denis Thompson landed his fish in day light time of the match while Rob Allison had to wait till last ½ hr to hook into his 3 lb 04 oz fish. Other members reported catching small codlings which is a good sign for next season. 1st - Denis Thompson - 5 lb 04 oz - 1 fish. 2nd - Rob Allison - 3 lb 04 oz - 1 fish. Ian Russell - 10 lb 14 oz. Rob Allison - 7 lb 07 oz. Ian Russell - 8 lb 14 oz. Philip Kilpatrick (Jnr) - 9 lb 10 oz. Phil Mead - 8 lb 11 oz. Denis Thompson - 5 lb 04 oz. Philip Kilpatrick - 9 lb 10 oz - 1 fish.